One thing’s for sure with this grow your own lark: no two years are ever the same. 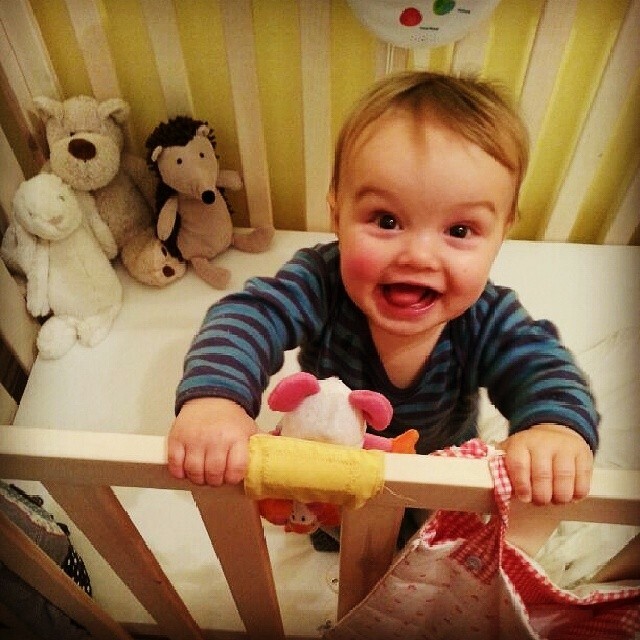 With a baby boy to contend with, plus a smaller growing space, 2013 has been like no other I’ve experienced before. As we reach that symbolic and reflective year end period, I thought I’d document some of the Real Men Sow highs and lows of 2013. The year began with a real high, and a new member of the Real Men Sow family. When I started the Real Men Sow, I made myself a rule that I wouldn’t let the blog veer towards personal posts. RMS was going to be all about the veg. However, after all the lovely tweets I received about my newly born son, I decided to discard my self-imposed regulations to officially welcome Lewis. The picture above is Lewis 10 months on. In March, I started a new feature, Allotment Cakes for the Weekend. The idea was to bake a weekly cake, with an allotment theme. The challenge was to find a tasty and seasonal recipe each weekend, which would prove particularly testing once the season had finished and I was left scrabbling around the shed for the last of summer’s stored apples. Things started well, and then I had to go on a diet to fit into a best man’s suit. I’m still baking though, just not weekly! In March, I learned a valuable lesson too, by virtue of planting out my broad bean seedlings way too early (just before night’s snowfall actually!). I live in a little pocket of the country where more often than not, we miss the bad weather and subsequently I’ve developed a habit of not taking the weather forecast very seriously. The peninsula where I am located is sheltered, dry and generally warmer than most other areas. However, I’ll be checking the forecast in the future. I was also fortunate enough to be given a tour of Great Dixter house and gardens, thanks to a blogging meet organised by the very lovely Naomi from Out of My Shed. The Dixter gardens were beautiful, but it was a talk by head gardener Fergus Garrett that inspired me the most. In April I began experimenting with making my own potting compost, using equal part molehill, leaf mould and kitchen compost. I loved this process, and will be doing it again in 2014. May saw a whole new take on Real Men Sow blogging in the form of a video. I wanted to try and get across the true size of my back garden growing space, and how I was trying to cram as much as I could in. ‘Filming’ was rather haphazard, but did feature Lewis and I kind of enjoyed it. June arrived, and brought with it my first meaningful kitchen garden harvests. 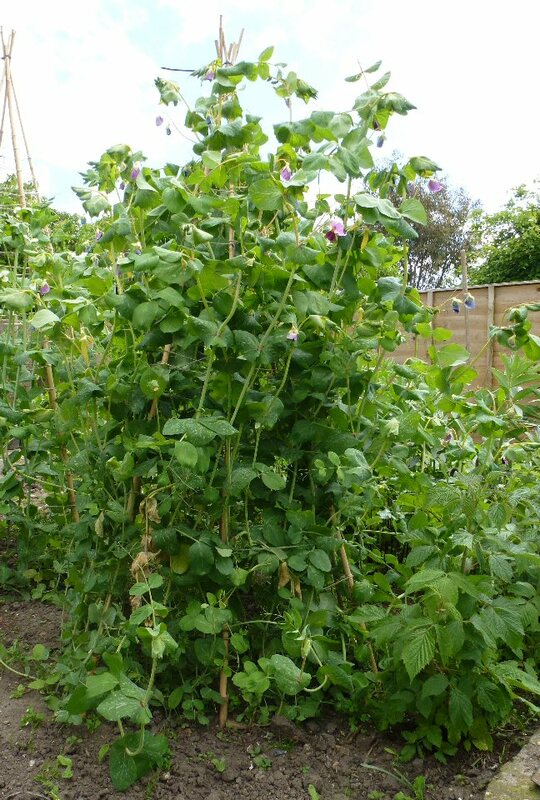 I’d been experimenting with growing peas and mangetout up wigwams as a space saver. I was not only chuffed with the crop (spare the last few pods that succumbed to pea moth), but I thought the wigwam made for a really attractive feature too. 2013 was also the year that mum had left me entirely to my own devices. I have to confess to being nervous about this whole new level of responsibility, but as summer unfolded I can proudly say there were some undoubted hits. I’ve been following for some time, and have also been looking at the rather scrappy patch of lawn in our rented house. We moved in in late August, so too late to do anything other than put a bit of bedding in containers this year, but I’ve negotiated a raised bed (10′ x 4′, so not at all big!) with the better half. I plan to fill it with veg, having had some experience with some crops in containers at our previous house. From your blog, I’ve discovered the principles of Square Foot gardening, and have picked up other tips too. A Christmas present of ‘Grow Your Own’ (complete with 6 packets of seeds!) has also helped with this enthusiasm – currently scouring the local free sheets/freegle for some deck boards and timber to make the raised bed. Thanks, and good luck next year! Happy New Year to you too Stu! Sounds perfect to me. That’s still 40 squares of vegetable opportunity! I’d recommend putting perpetual spinach, French beans and Cylindra beetroot in – all useful crops that make good use of small space. Try some vertical growing too. The wigwam peas and mangetout took up quite a lot of space really, but I’ve since found someone who made the wigwam inverted so that the space used in the soil was reduced. Let me know if there are any seeds you particularly want – I’m sorting through mine at the mo and have loads I’ll not get round to using. Smashing photo of Lewis and a great round up of the year. I’ve got big plans for making the most of my modest quarter plot with my dad next year. Did some experimental digging after a light frost the other day and was delighted to find how beautifully the soil turned over. Makes sense now I think about it. I’ve got two tiddlers (2 yr old and a 6 month old) and my 2 year old loves “big dig” visits with his mini-watering can and wheelbarrow, even at this time of year provided their short and sweet. All the best for 2014. Going back to an allotment reminded how big they really are. A quarter plot is still a good space, and with two of you working it I reckon the plot will be very productive for you. One thing I’m learning is that manageable sizes and success are important, especially when life is full of other stuff like family. It’s much more exciting and sustainable to get fewer good veg than lots of mediocre / failures. Keeps motivation and interest in check too!